Continuing ourannual tradition to pour on the love to twelve bloggers during the Christmas season, we're spotlighting Ellen Foord, maker at Minnow + Co as well as on DIY Network's Made and Remade. Ellen is a mover and a shaker. She has an electricity and an energy that is undeniable, and I've been blessed to have some of her goodness rub off into my life this year! Keep your eye on her... many great things to come in 2015! Don't forget to stop back every day to see if (you or) your favorites are featured! OK, this is a tough one, because as a family with a small child, we’re just starting to establish some of our own very own traditions. My favorite as a child was that we always got to open one gift on Christmas Eve AND we always got special Christmas pajamas. Those are two traditions we’re continuing in our family! My other favorite holiday tradition has to be the Garrity family holiday dip. It’s something I’ve never had ANYWHERE else, so to me, it is the thing that evokes "home + family + holidays". I wait for it eagerly every year. It sounds a little crazy from the outside - cream cheese, green olives, blue cheese, a little Worcestershire, and a little half and half - but it’s heaven on a cracker. For anyone who likes blue cheese stuffed olives in a martini, this dip is right up your alley. Mmmmmm…. Wellllll…. There’s actually a huge shift right around the corner for me. When I launched Minnow + Co. a few years ago, I thought life was going to chug on down one path, but it sort of zigged over in a very exciting and fulfilling alternate direction, contributing full time for DIY Network’s Made + Remade. Because of that, I really haven’t had any time to maintain any sort of presence on my own website, instead focusing on producing content for DIY Network and a growing range of clients - which has been thrilling. My new online presence will be more representative of the work that I do and the things I’m passionate about exploring now and in the future. Keep your eyes peeled in January! This was one of those projects that started out as a hazy, vague seed of an idea and then suddenly came together in a hot second. 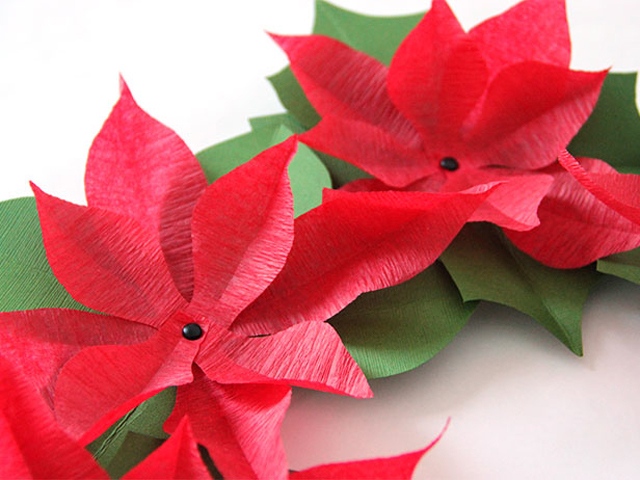 I wanted to put together a DIY paper poinsettia wreath and was planning on making it one way, but then a total klutz moment where I knocked over a box of rarely used supplies threw some crepe paper at my head and bam! The whole project magically came together in my head in about 20 seconds. AND - it was my first attempt at paper flowers, so I was kind of giddy with how it turned out. You know, outside of you, MJ, and our shared pals Emily Jeffords and Paige, Sheri Silver (Donuts, Dresses and Dirt, Babble) is one of the most generous, lovely and humble bloggers I’ve met in the few years I’ve been doing this. Even with all that she juggles, she still goes out of her way to shine a spotlight on the talents of her friends in her “blove” feature, and I love that. Kind of the same way I love you, MJ, for including little old me in this very impressive roundup of bloggers. Seriously, what am I doing here? I’m a total bull in a beautiful china shop of sophisticated bloggers. Girlfriend, you've more than earned your stripes amongst this crowd! I'm amazed with all of the projects you've created this year, and I know that so many more are on the horizon! So, so happy that our real lives have met up this year, and I'm ready for more! Every time I look at this picture, I grin. I grin that big, full-face, cheek-aching grin as seen above (me in stripes). I remember this moment vividly as my new pals and I sipped cocktails on the roof of (just to name drop here) Omnimedia, AKA Martha Stewart's HQs. This was a day in June 2013 known as AltNYC, and it was 24 hours of amazingness in NYC that changed the trajectory of this little blog. To make a long series of emails, excited phone calls, and FB exchanges succinct, I gathered this group together (+ one Sarah of Sarah Hearts!) to build on an idea I had. If you've spent any time here at Pars Caeli, you know I am all about community and lifting each other up - and we translated that into a kickin' proposal that we titled Alt Ambassadors. We sent it off with a wing and a prayer (and a whole lot of "please, please, please") in August. Fast forward ----> New Year's Eve. Ellen sends me a very exciting text that she's received an email from Gabrielle (cofounder of Alt) that Gabrielle would like to welcome us to AltSLC as Alt Representatives. Ellen, Emily, Paige, and I will be acting as Alt Representatives during the SLC conference. We'll be offering the warmth of the collaborative spirit of Alt and connecting new and experienced bloggers, answering questions, and being the ladies you can turn to when you have THAT ridiculous question that you really don't want to have to ask someone else like: where do I pin my business card or where are the sponsors I want to see? It's an incredible opportunity for the four of us, and we are honored to take on this new role. We'll be assisting speakers and greeting creatives in each breakout session. If you are headed to the conference, please come find us - we want to meet you and give you a hug (and tell you that, yes, that outfit is just the right look for the day, you are brilliant). To get that community vibe going, please follow the Pinterest board that I've started for AltSLC. This board will definitely evolve in the next days to include all the speakers, sponsors, and attendees we can find! We hope it can be an amazing resource for you and also all the others you want to connect with during the conference. All of the Alt Reps can pin to the board so feel welcome to grab any of us to get yourself pinned! I've preloaded about 75 of us that I could find...maybe you're already there... go check! And, well, here's the moral of the story for me. If you have an idea, or if you have a gem of an inkling of an idea, go after it. Try it. 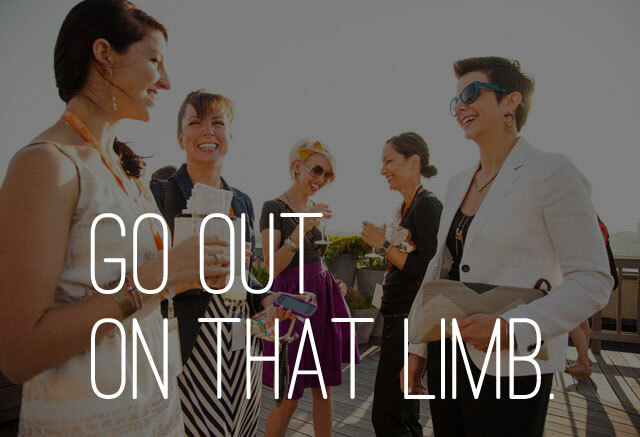 Connect with others who can make it happen! Sometimes crazy, amazing things can happen when innovative, intelligent people are listening. 2014 is going to be the year of going after your dreams or thinking up those dreams that you've been pushing off to the side for way too long now. Please forgive all of the exclamation points in this post!!! I am pumped about this opportunity to work alongside so many people that I respect and admire - and also I get to go to some drop-dread awesome parties in the mix. Wahooo!